Gregs Thomopulos, P.E., chairman emeritus of Stanley Consultants, has been inducted into the 2017 class of the National Academy of Construction (NAC). This organization recognizes and honors individuals for their distinguished contributions to the industry and shares this expertise as a service to the nation. The 2017 class includes 28 new inductees. More than 300 leaders were considered for NAC’s rigorous nomination and election process. During the formal induction, Thomopulos was noted as a champion of integrity and ethics in global infrastructure, a leader and mentor to academicians and students, and an outstanding contributor to engineering and to society. 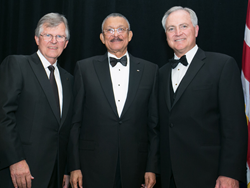 “The new members of the National Academy of Construction, like those before them, have earned the high honor of Academy membership through stellar careers and contributions to the engineering and construction industry,” said Wayne Crew, General Secretary of NAC. During his 51-year career with Stanley Consultants, Thomopulos served as president of the International Federation of Consulting Engineers (FIDIC), which is the global association of consulting engineering firms, based in Geneva, Switzerland, and as chair of the American Council of Engineering Companies (ACEC), based in Washington, D.C.
About Stanley Consultants: Founded in 1913, Stanley Consultants is a global consulting engineering firm that provides program management, planning, engineering, environmental and construction services worldwide. Recognized for its commitment to client service and a passion to make a difference, Stanley Consultants brings global knowledge, experience and capabilities to serve clients in the energy, water, transportation and Federal markets. Since 1913, Stanley Consultants has successfully completed more than 25,000 engagements in all 50 states, U.S. territories, and in 113 countries. For more information on Stanley Consultants, please visit http://www.stanleyconsultants.com.